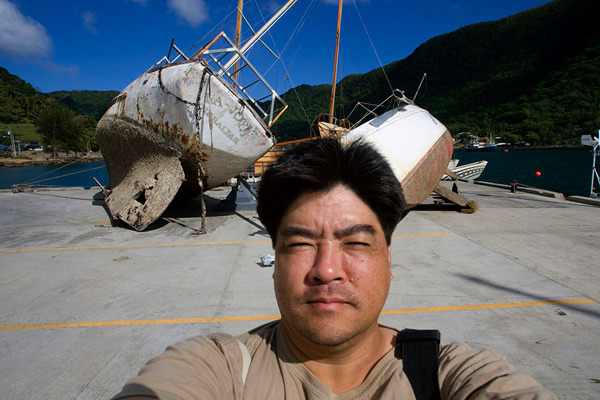 Photographer Eugene Tanner covered his first natural disaster in American Samoa. Eugene Tanner, freelance photographer based in Honolulu, HI. shown here at Pago Pago Harbor in American Samoa. My typical routine when I wake up in the morning is to make a pot of coffee and fire up my computer, get on the Internet and read up on the latest news that happened over night. This morning was different. Little did I know in 24 hours I would find myself flying across the equator to a tiny island in the south pacific covering my first natural disaster. That morning, just about every major news web site had a breaking news story on a major undersea earthquake with a magnitude of just over 8.0 happened just over a 100 miles away from American Samoa and the Independent State of Samoa. That happened about 8 a.m. HST. Within a couple of minutes a tsunami watch had been issued for Hawaii but by then American Samoa and Independent State of Samoa had already been hit by a tsunami about 10 feet high. By 9 a.m. the first reports of a tsunami hitting American Samoa started to show up on the Internet. I sent an email to Stephanie Mullen Associated Press News Photo Editor based in San Francisco and Jaymes Song, head of Associated Press Hawaii Bureau about the tsunami hitting American Samoa and the tsunami watch for Hawaii. I let them know I was packing my gear and going to Waikiki just in case a tsunami was on its way to Hawaii. Once I got situated in Waikiki Jaymes Song called and had me head over to Waikiki Aquarium because the National Oceanic and Atmospheric Administration (NOAA) was to hold a press conference there on something totally unrelated but AP was hoping there would also be some kind of briefing on the tsunami. All NOAA said was the tsunami warning for Hawaii had been canceled. My editors at the Associated Press later learned the Governor of American Samoa was on the Oahu and I was to head out to the American Samoan Government Office. So far I still had no photos or anything remotely interesting so I was starting to get anxious knowing AP New York might be calling soon wondering why I have not moved any photos. Upon arriving at the American Samoan Government office their phones were ringing off the hook. Many former residents of American Samoa plus news organizations from all over the world were calling trying to get any information on how badly American Samoa and the other Samoan Islands were hit. The only thing remotely interesting to photograph was a person answering the phone. After moving a couple of photos of a person talking on the phone I over heard one of the staff members talk about the Governor of American Samoa catching a United States Coast Guard flight back home. I called my editor at AP letting them know about the flight so they can work from their end on getting an AP staffer on that flight. After covering the Governor of American Samoa's press conference Stephanie Mullen of AP San Francisco asked if I wanted to go to American Samoa. I was the closest photographer available. The other AP staff photographers were all based on the West coast and it would take them almost 48 hours to get to American Samoa. I agreed and hustled home to find a sitter for my pets and to start packing. 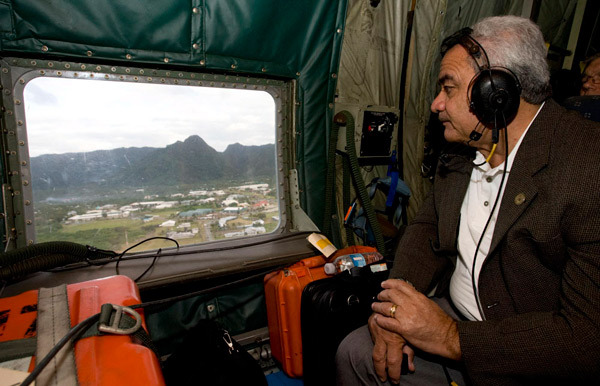 Togiola Tulafono, the Governor of American Samoa surveys American Samoa from a United States Coast Guard C-130 cargo plane Wednesday Sept. 30, 2009. I have never covered a natural disaster of this magnitude in my 23-year career as a photojournalist. AP was taking a risk with me. I was confident I could do the job. I knew AP was receiving stories and photos so there was some phone or Internet access on American Samoa. I knew there was a way to get my photos out. After a series of conversations with my editor Stephanie she let me know AP had secured a seat on a Hawaii Air National Guard C-17 cargo transport but it was not leaving until the next morning. I needed to get to American Samoa on the Coast Guard flight that night. Leaving the next day would delay my arrival by over 24 hours. I still did not have a guaranteed seat on the Coast Guard's C-130 to American Samoa. So 12 hours after starting my day I grabbed my gear which consisted of two Canon EOS-1D Mark IIN bodies, a 16-35mm zoom and a 70-200 2.8 zoom with a 1.4X extender plus a flash, a backpack with my computer, five bottles of water, a water purifying pump, a ton of cash in $20's, another small bag with three days of clothes and headed out to the Coast Guard station at Barber's Point. For two and half hours Audrey McAvoy, staff writer for AP and me negotiated with the Coast Guard on getting two seats. After putting much calm, cool, diplomatic pressure on the Coast Guard they gave us two seats! I was trying very hard to bump another member of the media off the flight. I hope he's still not upset with me. Sometimes you have to put your cause before others. Yes, we are bound for American Samoa! A C-130 is not built for comfort and it would take over eight and half hours to fly to American Samoa. Commercial jets can make the trip in five hours. After getting settled into our seats I put in my earplugs and tried to get some sleep I had a million thoughts going through my head on my game plan once I got to American Samoa. I kept telling myself to remember when working this assignment. Treat the subjects of my photos with respect, honor and dignity. Many of them will have lost everything they own. Some of them will have lost loved one. Photograph them but preserve their honor, dignity and give them respect! The seats in the C-130 were so uncomfortable. The eight and half hour flight quickly turned into what felt like 48 hours. I would veg-out, sleep for what I though was about 3-4 hours only to wake up, look at my watch and see only 3 minutes had passed by! Holy cow, this would turn into a long, long flight. It was so loud in the C-130 you could not talk to anyone. It was too dark to read. All I could do was just sit there and try to sleep. I'm never complaining about flying coach on a commercial airline again. We landed round 8:30 in the morning. I got less then an hour of sleep. I hit the ground running. I shot some photos of the crew removing cargo from the Coast Guard C-130 I flew in on then started looking for a place to edit and move my first set of photos. I tried to call my editor in San Francisco to let her know I had arrived safely. My cell phone did not work but I managed to borrow a phone. I worked with another photographer Hugh Gentry of Reuters and we found a driver who could take us around the first day. We started in the village of Pago Pago, shot for about three hours. We found a hotel with Internet access. I edited, sent my second set of photos. AP reporter Audrey McAvoy managed to get hotel rooms and a rent-a-car for us. We dropped off the rest of our bags then headed out to the village of Leone. As we were driving down the main road to Leone I could not help to notice how peaceful and calm the residents of American Samoa seemed to be. Residents of Leone, located on the western side of American Samoa sift through the debris hoping to find some of their belongings Wednesday Sept. 30, 2009. Compared of the island of Oahu, life on American Samoa moves at a snail's pace. The road to the village of Leone took a hard right and all of a sudden we were in the middle disaster area. Homes were ripped off their foundations. Cars, large shipping containers where tossed like toys. The entire contents of homes that were once inside where now outside. You could see people walking around in a daze. Some were looking for their belongings. Many of them just sat there with a blank stare trying to figure out what to do next. Leone was hit hard. The destruction blew me away! The power of water is just amazing! I came upon a lagoon where you could see several cars, trucks and so many clothes washing machines I could not count them all. There were times I would just be shell-shocked and looked around feeling overwhelmed by the destruction. I would constantly tell myself "Don't look, pick up the camera and shoot photos, don't look, shoot photos!" For the first day and a half I had to tell myself that everyday! One of the most yet difficult things to do is keeping in touch with your editors who are thousands of miles away. Regular phone service and cell phone service was unreliable. Because my personal cell phone did not work I rented a cell phone from the first hotel we stayed at. The cell phone network on the island was overloaded so service was hit and miss. The Internet access was slow but I managed to move about a dozen photos my first day. The second day was rough. We had to leave our hotel and return our rent-a-car because FEMA had taking over our hotel. I was delayed about 4 hours before heading back into the disaster area on the western side of American Samoa. My editors at AP were not happy. I got back on track again but I was way behind schedule. I still managed to move about a dozen photos but I made some mistakes on moving photos on a timely manner. I was determined not to let that happen again. That night Rick Bowmer, an AP staff photographer based in Portland, OR and Haven Daley, an AP staff videographer and reporter based in San Francisco had arrived. Having Rick there took some of the pressure off. Rick and I worked closely together making sure we did not cover the same area. If he was one the west side, I made sure I was on the east side of American Samoa. While driving to see how the tsunami had impacted the villages on the east side of American Samoa I drove past a NAPA Auto Parts store. I remembered Alex Brandon, an AP photographer based in Washington D.C. once told me you should always have several cans of Fix-A-Flat with you because you never know when you might run over some nails in a disaster area. I hung a U-turn, bought two cans. Later that day I had two flats. Fix-A-Flat saved my day! Thanks for the great advice Alex! Day three got off to a good start. My day started very early in the village of Asili. The people of American Samoa are some of the most amazing people I have ever met. In every village I photographed I was always greeted with a smile and open arms. I approached every person I photographed very humbly and depending on the situation I would talk to them first and ask permission before I started photographing them. There was one family, Aifua Talo Leo's family I had developed a good rapport with. I photographed them the day before building a makeshift shelter and cooking dinner on an open fire. I stopped by early in that morning to get some photos of them starting their day. I could see in their eyes reality had settled in. It was going to take a long time before their lives would return to normal. I tried to photograph more of their day but I sensed it was time for me to move on. 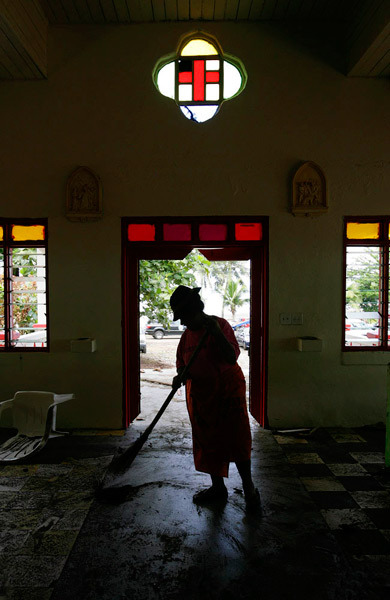 Leu Vaina, a resident of Asili Village, located on the western side of American Samoa helps clean up the Asili Catholic Church Thursday Oct. 1, 2009. By day four the story had shifted to the arrival of aide, cleanup and recovery. When I first arrived on American Samoa most of the bodies of the bodies of people killed by the tsunami had been recovered. Only two young children where missing. I came across Young Sang Woo, a resident of Asili Village, sitting on the foundation of his home next to a memorial he made for his wife and daughter. He lost his wife and his daughter was still missing. He was still in a state of shock. When looking into his eyes all I could see was disbelief and how emotionally drained he was. 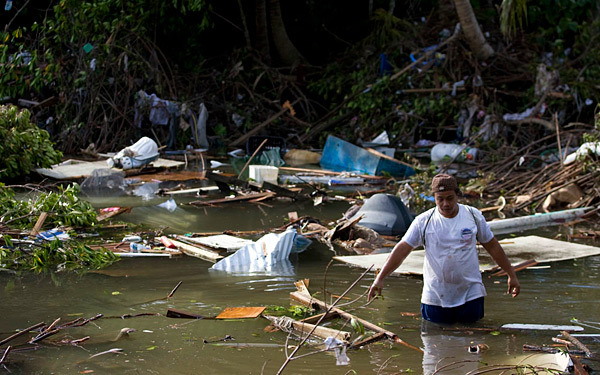 The fifth and sixth days were spent working on stories about the economic and environmental impact of the tsunami. The coral reefs on the west side of the island where destroyed. It will take hundreds of years for the reef to grow back. Sunkist Tuna has a cannery in Pago Pago and is the largest employer. The cannery was closed because the electricity was in short supply. It was going to weeks before it would reopen meaning over 2000 people were now unemployed. My sixth and last day on American Samoa was spent making one last drive through the west side of American Samoa. I shot and sent a couple more photos then returned to the bed and breakfast I was staying at to pack up and cleanup. I along with the rest of the AP staffers found a good Chinese restaurant and had a big dinner then headed to the airport. I have never traveled overseas and felt no need to get a passport. That is something I would need to get home to Hawaii. Hawaiian Airlines was quite shocked I managed to get to American Samoa without a passport. I explained to them I arrived with the United States Coast Guard. After spending an hour proving who I was and that I am an American citizen Hawaiian Airlines issued me my ticket. Flying home would be a nicer ride compared to my flight to American Samoa. Just over six hours later I was back in my high-rise condo that over looks downtown Honolulu washing my clothes, cleaning my gear, enjoying a cup of coffee and playing with my cats. I stopped and looked around my condo thinking what would I do if all of a sudden I lost everything I owned in a matter of minutes? I was also thinking about all the people I met and photographed on American Samoa. The whole experience had me thinking about what's really important in my life and how trivial many of my personal problems are. It took a couple of days to clear my head from the whole experience. My mom said I had some of the classic symptoms of post-traumatic stress syndrome but I'm ok now. Looking back I'm very proud of my coverage. The first two days of the tsunami coverage were rough but everything came together in the end. I would like to thank Victor Vaughan, AP National Photo Editor based in New York, Stephanie Mullen, AP News Photo Editor based in San Francisco, Jaymes Song, head of AP Honolulu Bureau, for giving me the opportunity of covering the American Samoa tsunami disaster. I would also like to thank Paul Sakuma, AP Staff Photographer based in San Francisco, Chris Carlson, AP Staff Photographer based in Irvine, CA, Alex Brandon, AP Staff Photographer based in Washington D.C., Rick Bowmer, AP Staff Photographer based in Portland O., Audrey McAvoy, AP Staff Writer based in Honolulu and Hugh Gentry, freelance photographer based in Oahu. Without their help it would have been a rougher experience. I hope to return to American Samoa in six months to a year to photograph the recovery and rebuilding of the villages that were destroyed by the tsunami. But first, I got to apply for that passport.